Sloppy Paul ($12.79): Our Reuben. 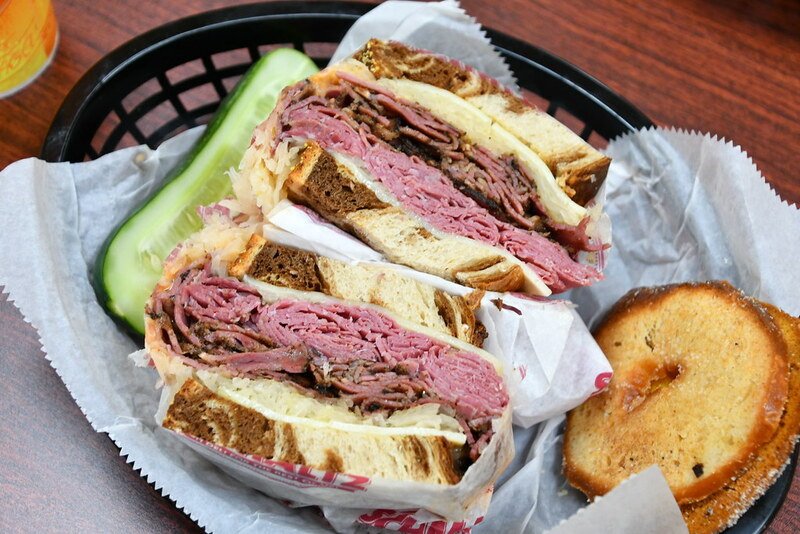 Warm SCHMALTZ FAMOUS CORNED BEEF or PASTRAMI on marble rye with Swiss cheese, sauerkraut and Russian dressing. Included Side Items: All sandwiches served with a half-sour pickle & homemade bagel chips when you dine in. Presentation: The sandwich was on marbled rye bread, lined with 2 slices of Swiss cheese against both pieces of bread. The meat was stuffed and folded against the bottom slice of Swiss, and then topped with the sauerkraut and Russian dressing beneath the top slice of Swiss. The sandwich was wrapped in paper, and then cut in half down the middle, and then the two halves placed next to each other on end so that the middle of the sandwich was facing up. The sandwich was then placed in a plastic tray bowl on another sheet of paper, with two bagel chips on one side, and half of a large pickle sliced longways on the other side of the sandwich. 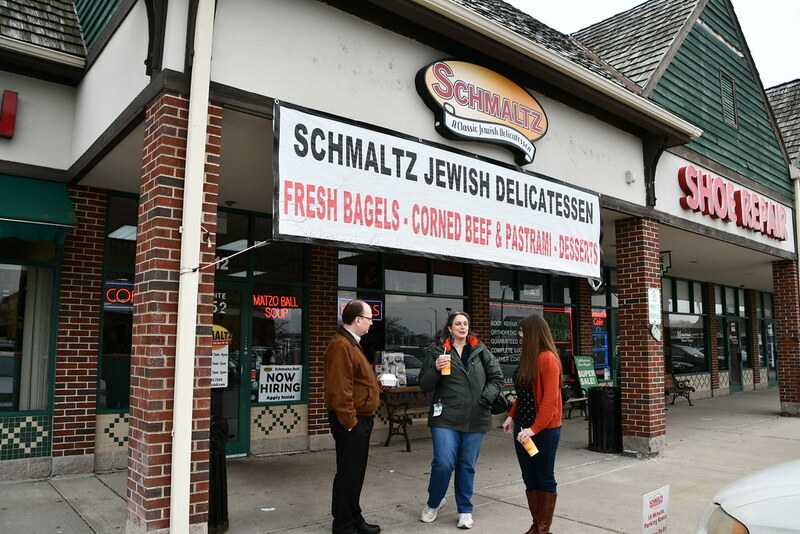 The Schmaltz Delicatessen is nestled in a strip mall, and not easy to notice from the street. However, it seems to take up two storefronts with plenty of seating. 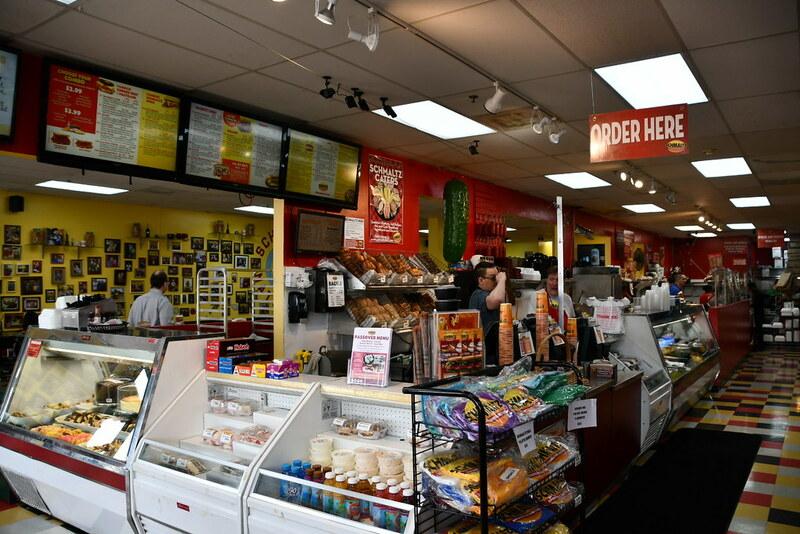 It has just about everything you would expect from a Jewish Delicatessen, including plenty of matzos, special breads, soups, and a section of historically Jewish food items, grocery style. Fountain drinks were available from a self-serve machine at the end of the ordering counter. We got there just after 11 a.m., and right before the lunch rush. As we were picking up our sandwiches ten minutes later, a steady stream of people started coming through the door. It seems to be a popular spot, and fortunately there is plenty of seating in the two dining areas to accommodate everyone. After ordering the sandwich, it was quickly prepared, taking only ten minutes until it was ready. 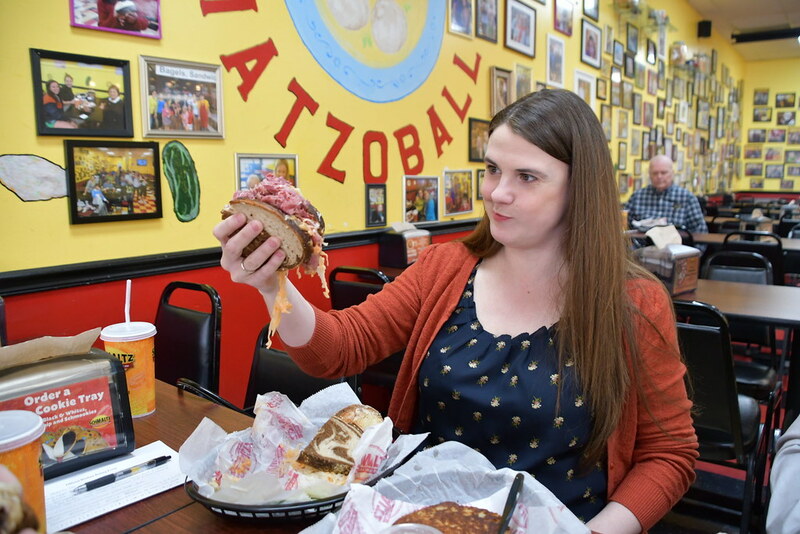 Their sandwiches come in two varieties: overstuffed and half-stuffed. 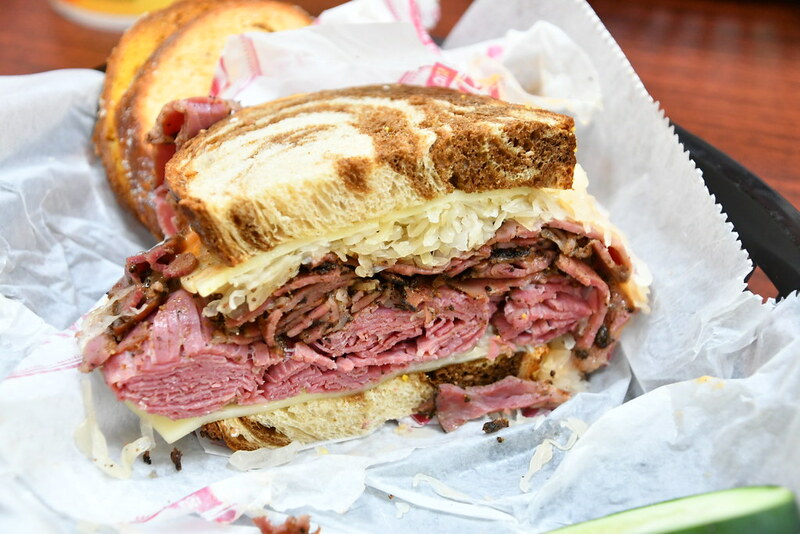 You can get the Sloppy Paul (the name of their Reuben sandwich) with either corned beef, pastrami, or both. I opted for both, so I could also get a taste of their pastrami. I wasn't disappointed. I think that their meat is one of the things that they are proudest of--especially being a delicatessen. And they demonstrate that by the way that the sandwich is served, cut in half and placed on end so that what you see when you pick up your order is a lot of meat, right there, in your face where you can't miss it. The sauerkraut and Russian dressing were also very tasty and I thought that they blended very well with the sandwich. The sandwich halves came wrapped in wax paper of some sort, I am assuming to cut down as much as possible on the messiness factor. However, it was still very messy. I used 3 napkins through the course of the meal, which is quite a lot for me. I didn't know until I had received the sandwich that the bread was not toasted or grilled at all. It was soft and room temperature. It was a tasty marble rye, but I think that if it were toasted that it would have given the sandwich that extra kick to give it truly an A+ for taste. Perhaps they would have grilled it if I had thought to ask, but alas, I did not. The sandwich was served with a huge pickle, sliced in half longways. The menu called it a "half-sour" pickle, but it really tasted more like a "half-sad" cucumber. It was fine for a cucumber, but really, a dill pickle or a pickle with more flavor would have been much preferred. The sandwich was served with two toasted bagel chips that were covered with what looked like powdered parmesan cheese. The chips tasted pretty good and made a nice side item for the sandwich.